Many people today opt for gluten-free diets. Some choose to live gluten-free lifestyles because they are aware of the possible health benefits, while others do so because they have a gluten intolerance. No matter the reason for your dietary restriction, you can enjoy the food at Benvenuto’s Italian Grill, the finest gluten-free restaurant in Fond du Lac. If you’re craving Italian cuisine but are having trouble finding a gluten-free restaurant in Fond du Lac, come to Benvenuto’s Italian Grill. We offer a wealth of menu options for people who avoid wheat products. You can devour delicious pizzas, sandwiches, and pastas at our gluten-free restaurant in Fond du Lac. 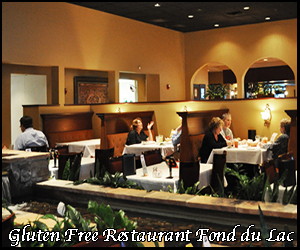 At our gluten-free restaurant, Fond du Lac residents can enjoy a wide range of healthy and delicious meals. To ensure the quality of our food, our gluten-free restaurant in Fond du Lac uses only fresh and all-natural ingredients. Dine with your family, and eat delightful dishes that cater to your diet at our gluten-free restaurant in Fond du Lac! When you have a dietary restriction, it can be difficult to find tasty meals that you can freely eat. This won’t be a problem when you come to our gluten-free restaurant in Fond du Lac. As a service to our customers, our gluten-free restaurant in Fond du Lac offers dishes that satisfy the taste buds and nourish the body at the same time. We have an extensive gluten-free menu that has been approved by the Gluten Intolerance Group ®. Whether you want pizza or sandwiches, our gluten-free restaurant in Fond du Lac serves them all. At our gluten-free restaurant in Fond du Lac, we understand that people have different dietary needs. As much as possible, we try to accommodate the special diets of all our guests. When you dine at our gluten-free restaurant in Fond du Lac, you can also ask for meatless dishes, low-gluten options, and low-carb items. The friendly staff at our gluten-free restaurant in Fond du Lac will take your requests into careful consideration. Finding gluten-free options as an adult can be challenging enough, but caring for a child with gluten sensitivity may be even trickier. If you and your family want to enjoy dinner free of wheat products, come to our gluten-free restaurant in Fond du Lac. Our gluten-free restaurant in Fond du Lac welcomes children. We even have a special children’s menu that your little ones are sure to enjoy. At our gluten-free restaurant in Fond du Lac, you won’t have to worry about finding tasty snacks for your gluten-intolerant kids. They can eat pizzas, pastas, and sandwiches to their heart’s content! Are you hosting a special event that includes guests with gluten sensitivity? Our gluten-free restaurant in Fond du Lac has you covered. We have private dining rooms and party rooms for your celebration. For groups of 10 or more, our gluten-free restaurant in Fond du Lac has special menus available. Now, you and your guests can celebrate your special occasion without worrying about finding wheat-free dishes for the party. Come and Dine at Our Gluten-Free Restaurant in Fond du Lac!